Chicken wire, window screening or cardboard webbing covered with paper towels soaked in a soupy plaster mixture for the basic substructure. A more contemporary method is to use industrial grade insulation foam boards shaped with a hot wire tool (available from Woodland Scenics) or serrated knife and then covered with plaster-impregnated gauze (like the stuff orthopedic surgeons use to make a cast for a broken arm or leg). Both terrain-shaping methods have their place. I prefer to make hills and mountains with the paper towel and hydrocal plaster method, although I used stacked insulation foam around my helix to contour the terrain. 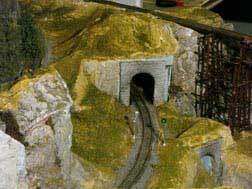 A combination of plaster hard-shell scenery and foam insulation was used to create the terrain on the Big Hill helix to South Point on my Utopia Northern freelanced HO model railroad.Some stacked 2-inch blue foam can be seen in the upper right. To make the underlying terrain, use blue or pink extruded polystyrene foam board, not the white bubbly stuff that comes as packing material. The most useful thicknesses are 1" and 2". I don't use foam where I'm going to have a lot of switch machines such as in a yard. You need to make a plate of tempered masonite or some such material to mount the switch machine on styrofoam.Then you have to secure it with construction adhesive squeezed from a tube. This can be more difficult when you want to mount a switch machine below a 2" thick piece of foam. Some modelers use Velcro. This can make it easier to position a machine like a Tortoise. It helps to have another set of hands when installing switch machines beneath the subroadbed. Foam board insulation is a good choice for city terrain because you can do a lot of your ground detailing work at your workbench or on a table and then install a bigger section. The board is lightweight and structurally stable. It is easier to make your city or town more three dimensional by stacking an extra layer on top of part of it. It is also good for small hills or as a base for lakes and ponds. You can carve it easily with an old steak knife, coarse sanding block or rasp and there is less danger of water made with epoxy or similar products seeping through a crack in the sub-base. It's messy to work with when shaping terrain because static electricity will make it stick to your clothes and hands and everything else nearby. If you want to make your railroad portable, then foam insulation is the way to go. It is possible to have a 2' x 8' piece with few supports. Don't stand on it! Place blocks of foam inside buildings to hold them in place. We do this on our club modules. Faux fur can be glued to the foam to make a field of grass. The fake fur is teased with a comb and shaped with a razor and scissors. The fur can be spray-painted in browns and greens. Ground foam or static grass can then be applied to the terrain along with a few small rocks. Here are some good benchwork ideas. Woodland Scenics publishes a great manual. Don't use glues like Goo or Pliobond on foam unless you want to come back and model a small creek or culvert. The glue will attack the foam and eat into it. The book by Dave Frary is one of the definitive guides to building excellent terrain and scenery. I consider it a "must have" in any model railroader's library. 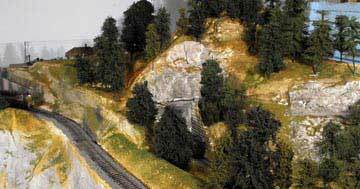 The advantages of plaster on screen or paper towels is that you can build up the thickness you want and then carve and shape it for model railroad landscaping. This method tends to be a lot messier. You need to make sure you wear old clothes and cover the floor where you are working. Plaster likes to drip, especially on cliff faces. When mixing plaster, add the plaster to the water, not the other way around. You want a mixture that is like thick pancake batter. Adding water to the mix once it starts to set up won't really thin it or retard the setting time. It will just make the plaster weak and crumbly. If this happens, start again. Use the old bits as rubble around the bottom of the cliff. Latex molds can be made or bought to make rock faces and cliffs. They can be put on your basic "hard-shell" scenery either semi-wet or when dry. Latex molds make better rocks and are less time-consuming than carving. Real rocks or a lump of coal can be used if you want to try making your own. The latex is available through hobby shops. Hydrocal plaster, made by the U.S. Gypsum Company and sold by cement dealers, is still the #1 choice for the basic hard-shell method. You can cover hydrocal plaster with a softer finish coat of molding plaster. You can also use drywall compound for terrain-shapping. The plasters are easy to stain but various types will take stain differently. Take this into account when adding "mortar" to blend rocks together on a cliff face or side of a hill. You can add some lamp black to the mix or even some black Rit or Tintex dye. Pre-coloring the plaster mix helps to disguise the white if the plaster is later chipped or if you drill holes in it for trees. Some modelers avoid Rit dyes because of the salt content but I have never had a problem. I like to give the rocks a light spray of black when they are still wet. 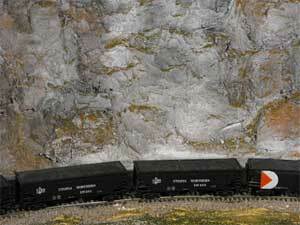 This brings out the relief in the faces and gives definition to model train scenery. You can also use thinned latex paints like beige and flat black. Dust on dry colors to produce the effect of mineral deposits. The pigments can be mixed into dry plaster before adding water. Pure dry pigment like this raw sienna is available through art supply stores and some hobby shops. If you use real sifted dirt, bake it in an oven at 250 degrees for an hour or so to kill any bugs or bacteria. (Get your wife's permission first!) Also pass a magnet over it to remove any metal particles that might be in it. The metal won't affect your scenery but can play havoc with locomotive motors. You can also use products like Scultamold to fill in around rocks or to make roads. It is a papier mache type of product. I am not fond of plaster of Paris because it sets up so quickly. Moulding plaster is actually composed of plaster of Paris but is easier to use. The curing can be slowed down with a little vinegar. The only place I will use it is if I want to make a tunnel portal. Now I simply buy ready-made portals by Chooch Enterprises or Juneco. This is a tunnel on the Big Hill using the described techniques of latex-molded rocks, plaster and zip texturing. The trestle is scratchbuilt. Working with plaster is very forgiving. If you don't like the effect you can add more or tear it out and start again. It's a relatively inexpensive method. Keep an old plastic bucket of water on hand in which you can rinse tools or discard old plaster. Never put it down the sink drain or you'll end up with clogged pipes and a big plumber's bill. An alternative method of making cliffs is to use pieces cut from ceiling tiles. These are stacked and hot-glued together. The edges are roughened with a rasp and back edge of an X-Acto knife. The tiles are stacked at a slight angle as is often seen in nature beside a highway that has been cut through rock.You can see the track that is climbing part way up the cliff if you look closely. I've added a little soil by the zip texturing method. Need to make some trees? Methods for modeling roads and streets. Return from "terrain" to my Home Page.